The Inter-School Sports Carnival 2018, a 5-day mega event organised by the school concluded with a gala prize giving ceremony. The event had over 800 students from over 40 schools of the Delhi/ NCR participating in Karate, Skating, Table Tennis, Chess, Badminton, Kabaddi, Volleyball, Basketball and Yoga. The grounds of the school came alive with the excited shrieks of the budding sportspersons of the country as they vied with each other for the Champions Cup, in a healthy competitive spirit. Playback singer, Indian Idol and Sa Re Ga Ma Pa finalist Mr. Desh Gaurav Singh presided over as the Chief Guest of the Prize Giving Ceremony. The cultural programme spread comprising of classical dance, school choir, sports dance followed by Ahir Dance was a feat to the body, mind and spirit. The Skipping Rope dance had the audience all agog. The audience was in for an unexpected treat when Chief Guest and playback singer Mr. Desh Gaurav Singh kindly agreed to entertain the young sports enthusiasts with his soulful rendition. School Principal Mrs. Priyanka Gulati presented the Vote of Thanks. The programme concluded with the Prize giving Ceremony. 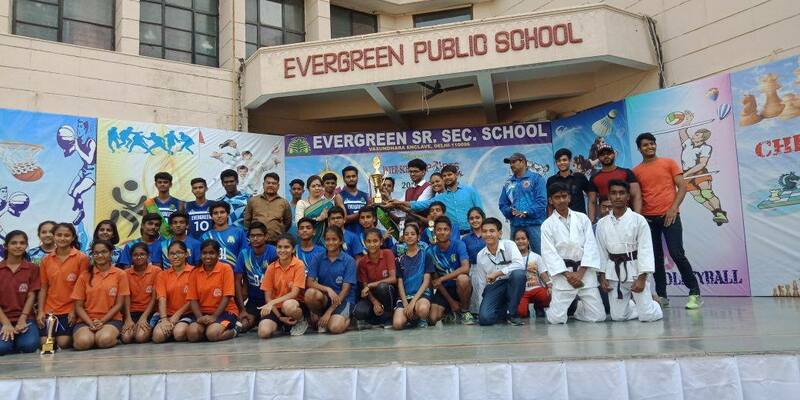 Ahlcon Public School emerged 2nd Runner-Up and Bal Bhavan Public School bagged the 1st Runner Up Trophy. Host Evergreen Sr. Sec. School lifted the Champions Trophy. Keeping up the spirit of true sportsmanship, the school passed over the Winners Trophy to the 1st Runner Up Bal Bhavan School. The programme drew its curtains with a silent pledge to continue contributing to the national sports in its own little ways.